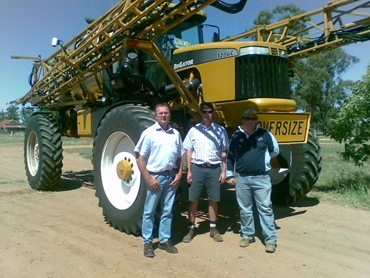 When Gilgandra, NSW farming mates David Jackson and Darren Murray struck up a conversation on cost efficiencies of spraying earlier this year, they settled on one conclusion. “It was a typical win-win solution,” David said. “As a spraying contractor I wanted to upgrade my rig while Darren wanted me to work for him on a 10,000ac (4000ha) cropping program. The sprayer the pair settled on was a Croplands Equipment 1286C RoGator complete with 36m (120ft) boom and appropriate technology fruits allowing auto guidance, auto boom shut-off, auto boom height control and mapping. Importantly it also met the requirement of good underframe clearance. “That’s (clearance) the reason we went for an SP because I do a lot of late foliar applications in crops like chick peas, canola and sorghum and the SP doesn’t knock the crops around,” David said. “At first I thought taking the 120 foot boom was too big because I was using a truck with a 1500 litre tank and an 80 foot (24m) boom and I thought I would have problems with trees. According to David he could expect to complete 400ha a day with the truck sprayer. With the 1286C sprayer he easily achieves between 600ha and 700ha a shift averaging around 60-65ha/hr, depending on conditions at an operating speed between 20 and 25km/h. When he needs to go back to a water source on a customer’s property, the boom hydraulically swings back for transport mode for a smooth ride. “You can get up to 60km/h on the road before you know it,” he said. David likes the six-speed range transmission which allows multiple on-the-go gear selection to match operating speed. The 1286C sprayer comes with a standard air-suspended seat with fore-aft isolators and reclining lumbar adjustment. An option in a semi-active seat suspension which integrates air with fluid, for increased comfort. All system functions, including the throttle and hydrostatic control, are in the right hand console adjacent to the operator’s seat while the hydrostatic control handle puts the most frequently used controls at your fingertips. The 1286C already has hit the 20,000ha (50,000ac) mark and David hopes to push through to 40,000ha (100,000ac) by the end of the year. As a contractor, of course, reliability is a key issue and David gives the 1286C the thumbs-up in that department. The 1286C is designed with centre-pivot self-levelling mounts to maintain boom height in undulating conditions while optional end nozzles provide coverage near fences. With a front-mounted 8.8L Caterpillar C9 electronically-controlled Tier Three engine pumping out 232kW (311hp) engine power rising to 251kW (336hp) with an eight per cent power bulge, traversing soft country is not a problem. “I can generally operate between 2000 and 2200rpm without much hassle and the fuel economy is pretty good when you average it out over all types of country,” David said. Apart from the advantages of guidance, night work is easier with six halogen work lights operating off two maintenance-free batteries and a160-amp or optional 200-amp alternator. Optional HID lighting provides even more lighting availability.